Built to Scale: When the municipality of Bowen Island needed to expand its wastewater treatment plant, it turned to ECOfluid Systems—again. Bowen Island is almost too good to be true. Located just a short ferry ride from Horseshoe Bay in west Vancouver, it’s a popular destination for visitors from the Lower Mainland taking a day trip, as well as those looking for a more permanent home away from home. 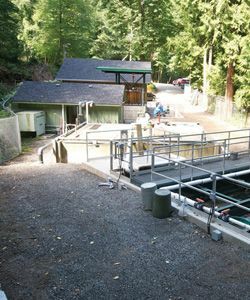 That’s why the municipality’s Snug Cove Wastewater Treatment Plant started to get just a bit too snug a few years ago. In the summer of 2005, the island’s government noticed a worryingly high level of stress on the plant during the high tourist season due to biological overloading. It was time for an upgrade. The municipality decided to bring back ECOfluid Systems, the company that built and operated the original plant in 1999, to do the job. The plans they agreed upon were ambitious: doubling the facility’s hydraulic and biological capacity, as well as the possibility of further expanding both in the future if conditions warranted it. In addition, conditions of a grant through the province’s Towns for Tomorrow program that partially funded the project (a federal grant from the Building Canada fund provided much of the rest) dictated that the new plant also had to include provisions for waste sludge dewatering and tertiary treatment capacity that would allow processed effluent to be reused for irrigation. As a result, Bowen Island now has a wastewater treatment plant that can not only service the existing needs of the community but grow alongside them. Thanks to the conditions of the Towns for Tomorrow grant, it also has a supply of treated wastewater that can be used on construction sites and even in the toilets and garden hoses of the rapidly expanding number of homes on the island that have dual-plumbing systems. Meanwhile, the sludge dewatering will increase the dry-solids content of the wastewater sludge that’s being taken off the island ten-fold, thereby reducing the number of trucks needed to haul it off the island and their resulting carbon footprint. The municipality is even exploring the possibility of using some of those solids for on-island composting that would generate a steady supply of new topsoil.